Jay Zendrowski is a resident of London, Ontario, and has taken to writing in the last few years. He is recognized as a chess master by the Chess Federation of Canada and has published two novels, both works of fiction. His first, The Soldier’s Mirror, was written in homage to his father, a veteran of World War II who landed with the Canadian troops on the French beaches on D-Day. His second novel, Every Breath You Take, is a mystery novel set in his home town of London. Jay is a Professional Member of the Crime Writers of Canada. The third novel in the Tee Pepper Mystery series is due to be released in February, 2018. A story of friendships forged in a time of crisis; of honour, and integrity. Set against the backdrop of the D-Day invasion of France, an old man’s dying confession reveals an intriguing tale of theft, unflagging loyalty, murder and soul-searching redemption. The unveiling of this family secret sparks a compelling quest as a dutiful son endeavors to complete his father’s final wish. The touching journeys of both father and son initiate a captivating series of unexpected life-changing events for everyone concerned; far greater than they ever imagined. St. Patrick’s Day is generally a quiet affair in the conservative university town of London, Ontario. For Detective Tee Pepper and his partner, Rupert Wallace, the assignment to locate a missing coed takes a quick turn when the young girl’s murdered body is found–all signs pointing to the work of a serial killer. In a case like they’ve never had before, a series of clues that seem to be directed towards them lead the two detectives deeper into the twisted psyche of a clever opponent. In the midst of a summer heat wave, London, Ontario is rocked by the senseless deaths of five teenage girls. A few weeks later, two suspicious deaths occur on the same night. Are the incidents related? Detective Tee Pepper, and his partner, Rupert Wallace, are assigned as primaries on the case. Pepper and Wallace must use all their ingenuity and deductive reasoning to try and wade through a complex array of suspects. Can they shuffle the deck and pull out the guilty card? Don is from a working class family in the beautiful town of Goderich, Ontario. He was able to translate an absolute lack of exceptionalism in high school into a career that included graduating from the Ivey School of Business, obtaining his CPA/CA with PriceWaterhouse, and working for thirty years for the 3M Company in the areas of income tax and pensions. He also owns a company that publishes the Canadian Tax Planners Newsletter and the Canadian Financial Planner. Although he has over thirty years of experience writing newsletters, he published his first book in 2017: Retirement Hell –Byproduct of a Middle Class under Siege. He volunteers in the community by providing seminars in the areas of estate planning and financial issues facing retired families. He is actively involved in Kidsport Canada, which is a charity that raises funds to pay for registration and equipment for children from families facing economic hardships. He is Chair of the London Sports Council and plays an important role in the London Sports Hall of Fame. He was also a founding member of a junior lacrosse team and coached box lacrosse for over a decade. Retirement Hell – Byproduct of a Middle Class Under Siege presents a bleak picture of retirement for many families. Baby boomers are retiring at a time when graduating students are entering the workforce with significantly fewer opportunities than their parents and grandparents. Factories will continue to close; while robotics and artificial intelligence will allow companies to produce more products with fewer, but highly skilled workers. As boomers move to retirement homes and into the great beyond, they have left two types of legacies. On an individual level, this generation has accumulated incredible wealth which will be transferred to their beneficiaries. However, collectively, the most privileged generation in history has left behind a world that will cause future governments to spend too much time, effort and money attempting to clean up issues that were left unresolved. I always wanted to be a storyteller. At recess time I would gather some of my schoolmates and entertain them with stories—some of my own, others just summaries of books I read. My life, however, took a different turn, and I ended up following a career in information technology (as Professor Irene Gargantini). This over, I reverted to my old passion: plotting intrigues and mysteries and creating romantic or passionate encounters. I took several e-courses on fiction writing and began jotting down my tales. So far I have written ten novels, several short stories and co-authored a novella. The genre varies from romantic suspense to thriller. See www.vermeil.biz and renenatanblog.wordpress.com. As an author, my goal is threefold: having fun in writing, entertaining the readers and offering them an uplifting vision at life. The Loves and Tribulations of Detective Stephen Carlton (ebook, romance) is centered on the life and misfortunes of a man of the law who falls in love with the wrong woman: a female athlete on the run. 2015. The Jungfrau Watch is a political thriller. A young man is raised to believe that communism is the panacea for all the problems of the world. Then the Soviet Union collapses, exposing all its crimes. What chances has a person like that to redeem himself? Available from the author. Prohibition. Thirteen years when America went dry. Blind-pigs were filled with rotgut and devious grifters, when Presidents served illegal wine at state dinners and women kicked aside their historical traces. Where the only difference between the cops and the criminals were their badges. A shady LAPD officer tangles with a beautiful, mysterious woman and risks losing everything. And she’s the least of his worries. Pre-order the ebook. Soon to be released on Amazone, Barnes & Noble and other popular bookstores. 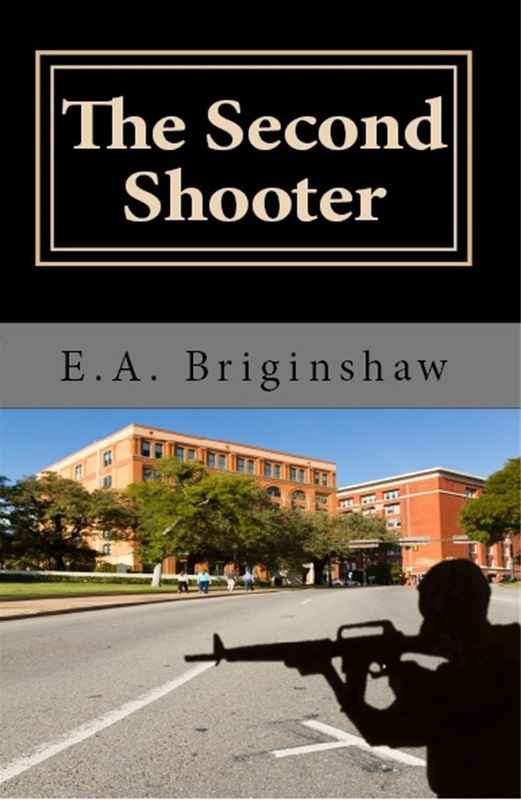 London Writer’s Society member Ernie Briginshaw’s sequel to “Goliath” titled “The Second Shooter” is now available in both paperback and ebook. It has been widely speculated that the FBI, CIA and Secret Service have been hiding the existence of critical evidence as to those involved in the assassination of President John F. Kennedy. The JFK Records Act requires that all records related to the assassination be released to the public by October 26, 2017, unless the President deems their release would cause grave harm to the nation. When some of these potentially dangerous records are accidentally released, forces within the government attempt to recover them using whatever means necessary, including the elimination of anyone who may have seen them. In the sequel to “Goliath”, David and Robert Shaw head off to university and find themselves drawn into the world of shadow governments and secret societies. Despite the work of an investigative journalist to uncover the truth, and the efforts of their father to protect them, they find themselves squarely in the crosshairs of “The Second Shooter”.